The Virginia Black Magic Pad is designed as a preparation pad prior to re-coating pre-finished floors, especially those finished with aluminium-oxide finishes. The Black Magic Pad features a hard, sharp abrasive grain. The aggressive grain etches the pre-finished floor without leaving swirls or scratches while easily getting into tough places missed by ordinary mesh screen products. 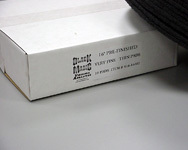 Black Magic Pads can also be used to correct minor finish damage on in-situ -finished floors. Like the Blue Magic Pad, the Black Magic Pad is very economical, as the grain is throughout the paid, not just on the surface.